The Archdiocese of Milwaukee operates seven mausoleums containing above-ground niches and we have columbariums in various locations within some of our cemeteries. Our mausoleums and columbariums are build using construction materials and engineering principles that insure permanence. We offer various sizes to accommodate one or more cremation urns. We have fronts made of glass and marble inside and granite outside. 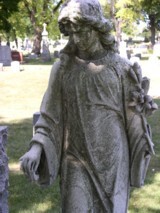 The Archdiocese of Milwaukee Catholic Cemeteries reserves a portion of every niche sales, even beyond state requirements, in a special endowment (perpetual) care fund to assure the preservation of these sacred burial grounds and to maintain their continued operation. In the unfortunate event of vandalism, the insurance carries of the Archdiocese of Milwaukee cover niche memorialization items placed on fronts to memorialize an above-ground inurnment. We have eight different cemeteries each with many niche locations and options, you can inquire about niche inurnment or initiate a purchase of a niche by calling or visiting any of our cemeteries to talk with a Family Service Counselor. You can request more information here. However you approach us, we wish to make a full disclosure of all your options and their costs.